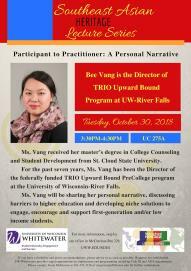 Bee Vang, Program Director of the TRIO Upward Bound program at UW-River Falls and recipient of a UW System Board of Regents’ Diversity Award, will talk about “Participant to Practitioner: A Personal Narrative” on Tues., Oct. 30th, 2018, from 3:30-4:30pm in UC 275A. It’s part of the Southeast Asian Heritage Lecture Series. If you would like to learn more, Andersen Library may be able to help! Use the Library’s resources to find books about barriers to education and ways to provide support for first-generation, low-income, or Asian American students, such as Bridging research and practice to support Asian American students (3rd-floor Main Collection, LC2632 .B754 2017; preview some text at Google Books) and Faculty and first-generation college students: Bridging the classroom gap together (3rd-floor Main Collection, LC4069.6 .F14 2011; preview some text at Google Books). Also available are Congressional committee hearings such as Improving college access and completion for low-income and first-generation students (online or in print in 1st-floor U.S. Documents collection, Y 4.ED 8/1:114-13), and Congressional Research Service reports such as The TRIO programs: A primer. Use Library databases to find articles such as “Remaking selves, repositioning selves, or remaking space: An examination of Asian American college students’ processes of “belonging.” (Journal of College Student Development, 2016, vol.57:no.2, pp.135-150, doi:10.1353/csd.2016.0016). This entry was posted in campus connection, info.gov and tagged articles, books, diversity, federal government, government docs, government info, higher education, lectures. Bookmark the permalink.